The Huawei Watch user manual is consisting of 62 pages. It's devided into 13 section. The manual provide detail reference information such as part overview, Using the watch, Gestures guide, Pairing your watch with an Android and iPhone on page 5 -8, Connecting your watch to a Wi-Fi network, Checking the battery, Managing apps, using Bluetooth Calling on page 24, Using voice service on page 28, etc. Then about Setting event reminders, Downloading new watch faces, Locking the screen on page 39, Setting the date and time, Restoring factory settings on page 42, Updating your watch, and more. Which phone operating systems are compatible with the watch? Can I use the watch after your watch disconnects from your phone? How many phones can my watch connect to? 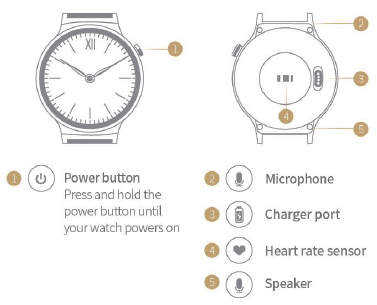 How many watches can a phone connect to? Why do Android phones take so long to reconnect to the watch when Bluetooth disconnects? Why does it take so long to reconnect to an iPhone when Bluetooth disconnects? Why can't the phone search for my watch? What is the watch's Bluetooth range? Can I use my Bluetooth car kit to take calls when my watch is connected to an Android phone? How are Bluetooth and Wi-Fi connections different? Why can't I power my watch off? Why isn't my watch charging? I can receive notifications and messages on my watch but cannot reply. Why? What can I do if my watch doesn't notify me when receiving notifications? Why can't I receive push messages on my watch when it is paired with an Android phone? Why can't I read whole emails on my watch? What can affect the heart rate monitor's accuracy? Can I make calls on my watch when it is paired with an iPhone? Can I take calls on my watch when the phone paired with my watch is connected to a Bluetooth headset or speaker? Why is the in-call volume so low? Can I play music in speaker mode on my watch when it is paired with an iPhone? Can I record audio with my watch? How do I use this feature? What can I do if the volume of my watch recordings is too low or there is too much interference? Can I use my watch to add, modify, or delete contacts? Why does my watch not respond when I say "Ok Google"? Huawei Watch_Why can I only open WhatsApp, Facebook, Gmail, SMS, and other apps on my watch using the Ok Google voice command, but can't sync the icons of these apps on my watch? Which third-party apps does the watch support and where can I download them? Why doesn't the weather app retrieve weather data? What languages does the watch support? What is the best way to configure the language settings on my phone and watch? How do I view the version number for the Android Wear app and update to the latest version?